Place the tomatoes in a large roasting tray roughly 25 cm x 30 cm. Cut the peppers into thin strips and add them to the baking tray together with the chicken thighs. Add the chopped fennel and mix with the other ingredients. Sprinkle the paprika, garlic oil, balsamic vinegar and a good pinch of salt and pepper over the chicken. Toss all the ingredients together and then spread the chicken thighs across the tray. 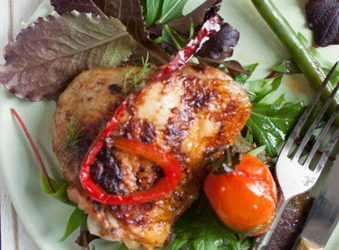 Five minutes before you are due to serve the chicken add the steamed green beans and baste them with a little of the cooking juices. Return the roasting tray to the oven for the beans to warm through and the chicken to finish cooking.